NWRMNTC (pronounced as /new romantic/) is the solo project of musician and sound designer Ana Quiroga (former half of the duo LCC). NWRMNTC explores new ways of music storytelling and multimedia practices through mystic and experimental cinematic soundscapes which navigate between dark techno and ambient sounds. Presented at Somerset House Studios, she has also performed at Art Night London, NTS Radio, Corsica Studios and KAOS London among others. 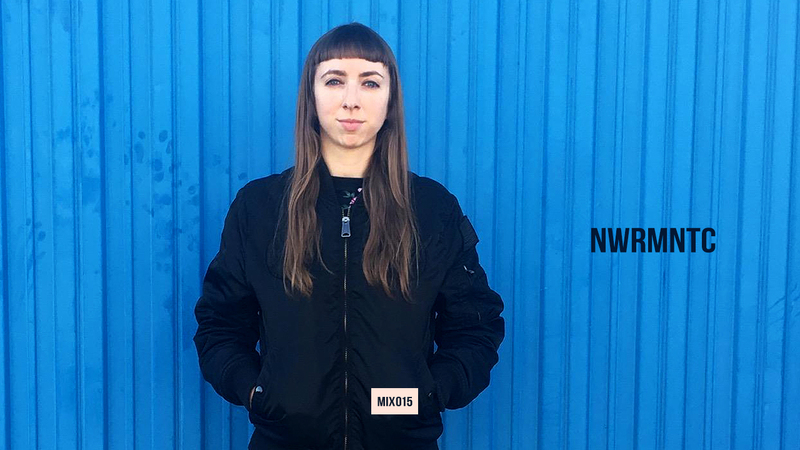 Recently, NWRMNTC has released music on Arboretum and QTZLCTL and she's currently working on new releases and also collaborating with new media art project CLON in AV and VR projects. They are currently presenting a new immersive live AV game simulation: META. 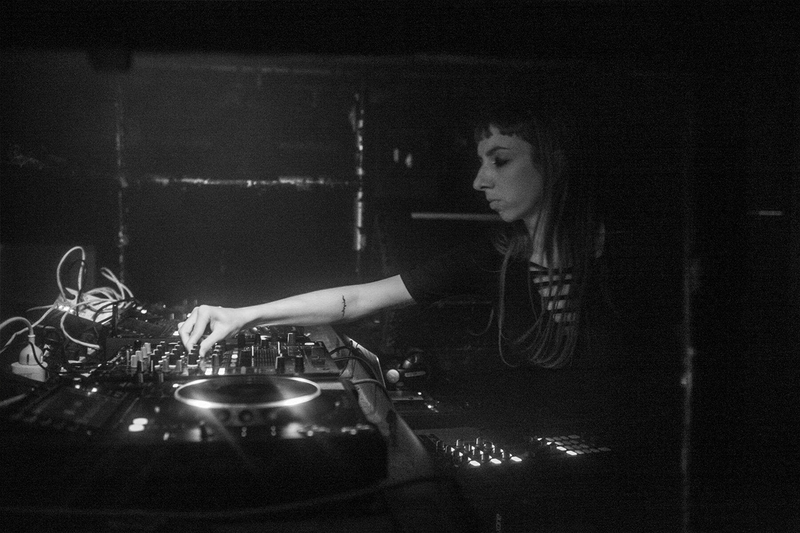 Surrounding the release of this mix, we got a chance to catch up with Ana Quiroga, where we talked about her new project NWRMNTC, her move to London and a new A/V show she's got in the works. Hi Ana. First of all, thank you so much for taking the time to do this mix and interview for us. I’m very excited. Thanks you! It’s a pleasure! I wanted to start by asking you about the mix. How, where and when did you record it? I did it in my studio in London, using Ableton Live and MIDI controllers. I have a very unorthodox way of mixing as I’m not a typical DJ, I am more of an experimental selector. You mentioned that this was a special mix, how so? Is there a theme to this mix? Yes! It’s a storytelling mix crossing different electronic genres and artists which have influenced me as music producer. So it brings some classics more than new music. I have to say recently and specially since I’ve moved to London I’ve been influenced by other styles and artists and also I’m doing a very conscious research into female and non binary artists, breaking my own boundaries and supporting the new necessary balance. But for this mix I wanted to focus on my past 15 years to show which electronic sonorities have influenced me more. One day I should make one only about rock and pop music as that’s my real background! NWRMNTC playing live at a recent gig in London. Photo by Zbigniew Tomsz Kotkiewicz Photography. You and I met when you were still working under the LCC - Las CasiCasiotone alias (together with Uge Pañeda) and you did a remix for the Ripples Remixed compilation. Together you released on labels such as Editions Mego and Modern Obscure Music and played Sonar festival and more. What prompted the project to end? LCC was an amazing passionate project that we started from scratch and took us to places we would have never imagined. But everything has its own space in this world and It was a natural process to finish the project after 8 years walking together. Last year you contributed to sending some of your sounds to space on a collaboration with Sonar and SETI. How was that experience? That seemed like a proper send off for LCC’s material! Yes, what a way to say goodbye! We were so excited! We created a loop with the sounds of Adámas one of our tracks from our first album ‘d/evolution’ on Editions Mego. I’m a sci-fi geek so imagine. My voice crossing the space! It’s still hard to believe.. No words. I guess this is a good moment to talk a bit about your “new” project NWRMNTC. Tell me about a little about it. Is it your solo stuff? With NWRMNTC (pronounced as /new romantic/) I want to explore new ways of music storytelling and multimedia practices through mystic and experimental cinematic soundscapes. It’s a dynamic project which allows me to explore sound in all the possible ways, as mixes, music composition and sound art. And was NWRMNTC born when you first moved to London? It started in London but before I moved here. My first appearance was in October of 2016 at the opening of Somerset House Studios. I made a 4h set. You can listen part of it here: https://soundcloud.com/nwrmntc/nwrmntc-somerset-house-studios Then, at the beginning of 2017 I moved to London. How do you find living and creating in London? Inspiring? Challenging? London is an amazing city but also overwhelming. It’s so big! And expensive! (laughs) And sometimes it’s a complicated jungle… But at the same time it’s very welcoming, specially if you can enjoy the hood life as it’s my case. I live in Hackney and it’s a super inspiring place. So many things going on, culturally active, very mixed and alive. Musically and also personally London is a source of inspiration and a tool to open my mind every day, putting myself out of my comfort zone all the time. For me it has been a big challenge because I come from a very small area (Asturias in Spain),quiet, not very populated and where everybody knows each other and I was living there for more than 30 years! 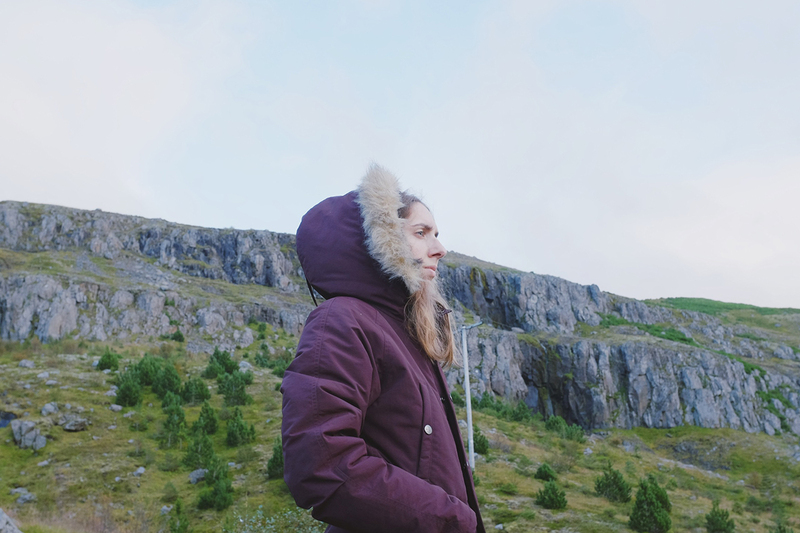 Ana Quiroga aka NWRMNTC in Iceland, during her time at the Heima Arts Residency. Is NWRMNTC your first solo project or have you had others in the past? Yes, it is. Prior to LCC I used to dj a lot in pubs and clubs (more rock than electronic music). And before that, I used to play the electric bass and I was part of two bands. The first one was an alternative rock project, pretty similar to The White Stripes and Yeah Yeah Yeahs. And the second one was a brit-pop band. As you can see, my background is very mixed and quite far away from the electronic and clubbing scene!. Music has been always my passion although I never studied music and all I know I have learned by myself, experimenting. Did you purposefully want to try it on your own for a while after so many years of working on a shared project with someone else? It must be hard to coordinate, be 24/7 with them etc. NWRMNTC also came naturally as a personal exploration and I’m loving it, although at the beginning I felt a bit weird. I personally find working solo more challenging because I’m used to working in a team but I know collaborating with other people can be extremely difficult. I have to say the workflow we had as LCC was very easy and we made a great team which helped us to be focused on the difficult moments and work 24/7 on the project with passion. It became our life project. I’ve done also lots of other collaborations as LCC and as solo. I think when you collab with other disciplines and everybody has its own space inside the project (as music/visual/dance/poetry) and you can keep your artistic individuality the collaboration is easier. Communication is the key to avoid misunderstandings and also settle some basic rules to respect the space of the other. And above all, believe in the project and be generous. You can’t collaborate honestly without generosity. Sharing makes as better, I mean for everything we do in life. 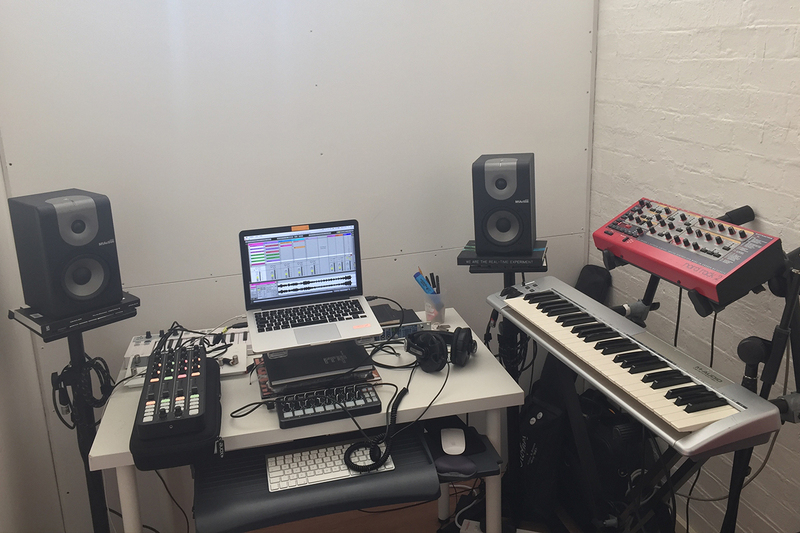 NWRMNTC's studio setup currently entails a MacBook Pro, RME Fireface UC, Waldorf Blofeld, Clavia Nord Rack 2, Arturia Keystep, M-AUDIO Keystation, Allen & Heath XONE K2, Novation Launch Control, mic and electric guitar. What are a few essentials in NWRMNTC’s studio (gear / software etc)? The most essential gear for me is the laptop (using Ableton Live and Logic Pro in a Mac) and a good audio interface (RME Fireface UC). My work is based on field recordings and sound processing. I use the handiest recorder ever (Zoom H1) and sometimes even the Iphone. Both of them have an impressive sound quality for their specs. With them, I catch sounds for the environment from objects to animals, urban and natural landscapes and lots of human voices, including my own I use a lot too. With all that library, I decompose and manipulate the sounds to create a unique sound signature. But I don’t only work with software, I also have two synths (a Waldorf Blofeld and a Clavia Nord Rack 2) and an electric guitar. And you also have a collaborative project called META with Estela Oliva aka CLON. Explain to us what this project entails? Estela and I started to collaborate together in 2017 when we made an artistic residency in Heima, Iceland. During our time there we created some audiovisual pieces using photo scanning, 3D images and field recordings from the surroundings and we made a show in Reykjavik. Back in London, Estela created CLON and I made the sound design for two of the works: a concept film JANMAR B17 and a VR experiment called TSDOMS. At the end of 2018, we started developing an audiovisual performance called META, an immersive journey into future and unknown worlds. 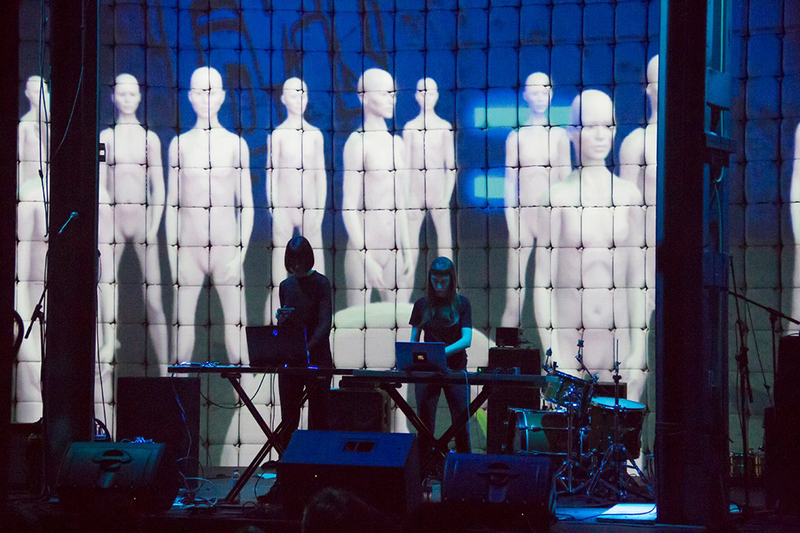 We perform live as a game simulation with a live soundtrack. Inspired by sci-fi narratives and cyberpunk aesthetics, the show invites the audience to explore fictional scenarios depicting interconnected utopian and dystopian worlds. The performance is presented as a view in first person, allowing the public to feel totally immersed in the simulated game and its narrative, like a transient traveler of the virtual space. During the show, CLON conducts a live journey through a speculative world composed of 5 scenes created using video game tools and techniques. Elements from the physical realm derive into a computer simulated world which exists outside our current systems and rites, blurring the perception of reality. In parallel, I play a live soundtrack featuring cinematic atmospheres with dark ambiences, tribal rhythms and digitally processed voices, which create a mystic palette of imaginary worlds. NWRMNTC and CLON during a live performance of their collaborative project, META. Do you work on material simultaneously? Or do the visuals come first and then you work on the soundtrack? How does the creative process work between you two? Usually the visual part comes first as it’s easier to create the sound as a companion. But we also work on paralel. Estela who has created the concept and the story shares with me drafts and ideas which I take as the base for my inspiration. We have absolute freedom in the development of our fields, it’s a very fluid and natural collaboration. I read as well that you are doing a special premiere at Sonar Hong Kong? Anything special planned for that? Yes! We are very excited. It will be the Asia premiere and just a week before we will play in Lyon at Mirage Festival. How is it for you to collaborate with other artists vs working on your solo material? Is one easier than the other for you? Musically it’s easier because you have absolute freedom but I love to collaborate with artists from other disciplines to develop bigger projects. I especially enjoy creating music for images as my way of music composition is very visual. I also like to challenge myself and create stuff for things I’ve never done before, as in the recent CLON’s VR project. Any other collaborations planned in the near future with NWRMNTC? For the moment, continue developing META and maybe, if I have time, make some remixes that I’ve been invited and I’d love to release. I’m always open to collab. So ping me everybody! What’s next in the horizon for NWRMNTC? Any release plans or showcases you can tell us about? I’m preparing my solo debut release which is a baby yet but it’s taking shape slowly and healthily. I’m always creating new mixes for the invitations I receive and recently I’ve just done a new music collab (under my real name, Ana Quiroga) with my beloved friend Sara Torres for her new poetry performance, Phantasmagoria, from her new book. On the other hand, with CLON, we want to tour our AV show META as much as possible and I’m playing quite often in clubs. So non stop! Well, thank you so much again for taking the time to do this mix and interview with us! All the best in your coming shows and creative endeavors.